The recent years have seen biometric technology grow by leaps and bounds which has also immensely helped the growth of the device manufacturers. In today’s times, there are abundant choices of biometric devices provided by a variety of manufacturers. However, it is necessary to have a thorough understanding of your security requirements and then choose the device that best suits your personal or business needs. As there are many manufacturers providing a plethora of devices, it is necessary to select a reputable and professional company that delivers outstanding products. What to look for (choosing the right device/manufacturer)? We will discuss some factors below that should help you in choosing the right device/manufacturer. In biometric identification, a scanner extracts the image of the identifier and converts into a digital template. This template is subsequently stored in a database that will be used for future matching. The techniques that are used to convert the extracted images into digital templates vary from manufacturer to manufacturer. The quality of the extracted images is highly important as poor quality of images would lead to false rejection rates. It is therefore recommended to select fingerprint readers from manufacturers that are compliant with standards FBI IAFIS IQS Appendix F & PIV-071006, WSQ, etc. This ensures that the readers are of a high quality. Moreover, select devices with a high DPI (dots per inch). Most consumer readers should have a DPI rating of 500. A deciding factor for the selection of these devices is the speed with which these devices can accurately identify authorized individuals. For big facilities where a huge number of employees are enrolled and hundreds of matches performed every hour, processing speed becomes even more important. Thus, it is recommended to select readers from manufacturers that are able to enroll and match fingerprints at acceptable speed without any degradation in accuracy. False acceptance rate and false rejection rate are very important parameters in the comparison of two devices. When the current fingerprint scanned by the reader is matched with the database template of the same person, it is known as genuine matching. When it is compared with other templates, the matching is known as impostor matching. Ideally, readers should have a genuine score of 100 percent and impostor score of zero percent. False acceptance rate implies that the impostor scores are sufficiently high so that the matching algorithm considers them as genuine and grants access. However, in false rejection rate the matching algorithm treats the genuine scores as impostor scores because they are not high enough and denies access. FAR and FRR can be found in almost all these devices due to some uncontrollable extrinsic and intrinsic factors. Therefore it is recommended to look for devices with minimal overlapping between genuine and impostor scores. In this section, we will be discussing the top five biometric hardware companies and some of their highly popular readers. The companies that we will be featuring in this section include Cross Match, SecuGen, Lumidigm, Nitgen and Suprema. 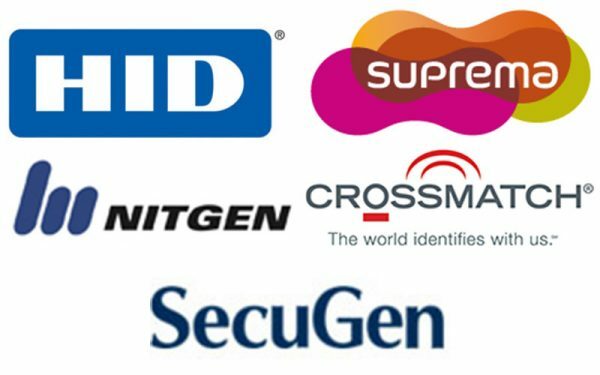 SecuGen has been in the global biometrics industry since 1998 and is one of the world’s leading providers of optical fingerprint recognition technology. With its continuous commitment to research and development of this technology, SecuGen is able to provide the highest quality advanced fingerprint recognition products, tools and platforms to its customers along with dedicated technical support. SecuGen is well known for its high durability and accurate SEIR-based sensors that support a wide range of platforms and proprietary extraction and matching algorithms. SecuGen readers are FBI certified and have been implemented in different types of industries ranging from information security, immigration, financial transactions etc. 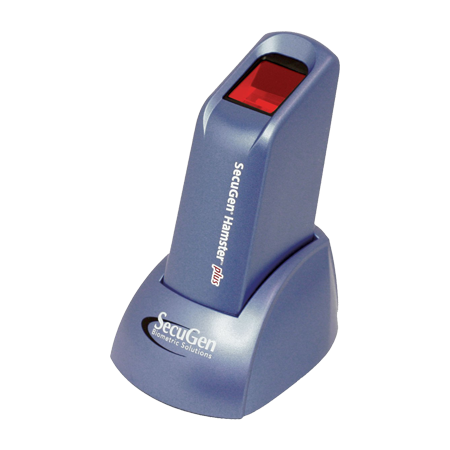 Hamster Plus is SecuGen’s most popular and versatile optical scanner and features a comfortable, ergonomic design along with patented SEIR fingerprint technology. The Hamster Plus is built with the industry’s most rugged optical sensor and has various advanced features such as Auto-On and Smart Capture technology. The Auto-on feature will automatically check for the presence of a finger. As soon as the user’s finger touches the sensor, the Hamster Plus turns on and captures the images without needing any system prompt. The Hamster’s Plus Smart Capture technology allows it work with varied quality fingers that are usually difficult to scan. The Smart Capture technology automatically adjusts the sensor brightness and enables the Hamster Plus to capture high quality images of even wet, scarred, aged or dry skin and also under very bright ambient conditions. Some other advantages of the Hamster Plus are portability and maintenance free sensor that is resistant to scratches, vibration, impact and electrostatic shock. 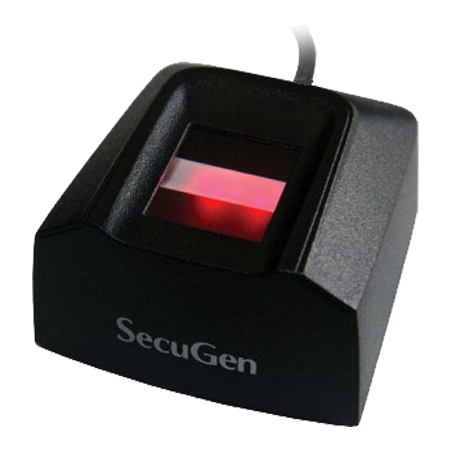 The SecuGen Hamster Pro 20 is an ultra-compact USB reader with FIPS 201/PIV FBI certification and Mobile ID FAP 20 compliance. The Hamster Pro 20 has a low-profile and IP65 rated dust and water resistant design along with a rugged sensor that adds to its durability. 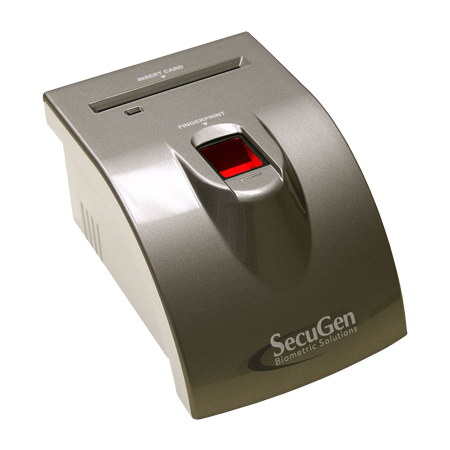 The scanner is thus highly resistant to any kind of scratches, impacts or electrostatic shocks and also works very well with hard to capture fingerprints such as dry, aged, moist or scarred. The manufacturer also specifies that the Hamster Pro 20 has fake finger rejection feature that enhances its security. Thus this scanner rejects any latent or spoofed images such as photocopies. 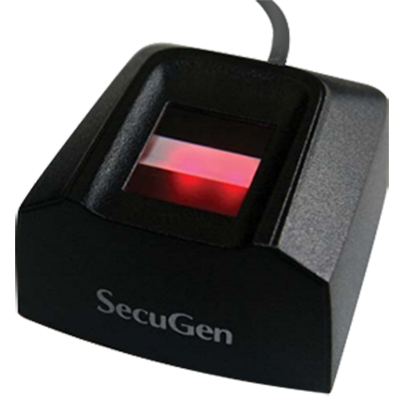 The SecuGen iD-USB SC/PIV is a combination fingerprint and smart card reader that comes in a ready-to-use USB device. This device is FIPS 201-compliant and FBI certified PIV single finger capture device suitable for dual-factor authentication applications. The iD-USB SC/PIV incorporates a high performing, rugged optical sensor along with a PC/SC smart card reader. It is based on the same optical sensor that is used in the Hamster IV fingerprint reader. This sensor is resistant to any type of scratches or shocks and the device also comes with an integrated finger guide that enables ready access by any finger in any orientation. Founded in 2002 and headquartered in Spartanburg, SC, Integrated Biometrics is a global provider of fingerprint sensors serving a wide variety of industries and customers. The company’s clientele includes hardware integrators, contractors working for the government agencies, software and database suppliers and commercial outfits worldwide. Unlike traditional optics and silicon fingerprint technologies, IB’s alternative approach to the fingerprint extraction technology makes it stand apart. LES (Light Emitting Sensor) is a patented technology developed and manufactured by Integrated Biometrics to overcome the inadequacies other traditional techniques suffer with. LES technology can not only capture fingerprints from dry, dirty or wet fingers, but also produce higher quality fingerprint images than its optical or silicon counterparts. Integrated Biometrics’ fingerprint technology is specifically designed for mobility markets to collect high quality, standards based, “certified” fingerprints for large scale identification or authentication needs such as Military, National ID, Law Enforcement, Public Safety, Immigration and Border Patrol applications. Looks can be undeceiving too, specially with Kojak, the 10-print FBI certified FAP 60 fingerprint live scanner from Integrated Biometrics. Despite being a 10-print (4-4-2) scanner, Kojak does not anywhere compromise on compactness. Its lightweight and power efficient design is unparalleled in industry. 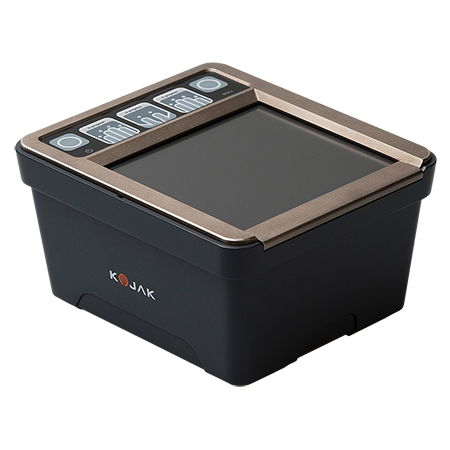 Unlike big, heavy and power hungry traditional 10-print scanners, Kojak does the job with greater efficiency consuming way less power. Scanning surface contamination with leftover prints becomes a thing of past as Kojak’s patented LES (Light Emitting Sensor) technology leaves no room for latent prints on scanning surface. Already competitively priced, Kojak further eliminates the need of consumables (silicone membranes or cleaning tapes), resulting in cost cutting without cutting efficiency. Trusted by industry experts, Kojak features easy integration with applications via the SDK provided by Integrated Biometrics. This robust scanner meets or exceeds the U.S. military durability specification and can easily withstand extreme environmental conditions. Protected against water, dust or dirt ingress, Kojak sets the new standards of durability. Equipped with Integrated Biometrics’ patented LES (Light Emitting Sensor) technology, FBI FAP 45 certification and 256 bit AES encryption, this ergonomically designed compact fingerprint scanner takes a very little space to make a big impression. Developed specially for mobile and desktop applications, this little master also comes in a temper proof design. LES film technology allows Watson Mini to capture fingerprints from dry, wet and even dirty fingers and produces high quality fingerprint images. Watson Mini was developed keeping security of biometric data in mind. It leverages 256 AES encryption to communicate with external applications and devices, making the personal data secure at the point of acquisition, during data transfer and into the host application. That’s not all, its temper proof hardware leverages a unique calibration file installed in each serialized unit, rendering it unusable if tempered. Safeguarded against physical as well as logical abuse, Watson Mini becomes a natural choice for applications with high level of data security requirements. Everything else may seem too big in front this small single-fingerprint scanner. Meet Columbo, the world’s smallest, fastest and lightest FBI PIV FAP 30 certified fingerprint scanner. Do not let its compactness fool you. Despite being small, Columbo produces high quality fingerprint images, thanks to its patented LES (Light Emitting Sensor) technology, which can extract fingerprint features even from dry, wet and even dirty fingers. Unlike optical scanners, which are prone to noise with latent prints on their scanning surface, LES tech entirely eliminates the need of cleaning the scanning surface, saving time and efforts in back to back scanning situations. It is very easy to integrate it using single SDK for all IB’s FBI certified products. Columbo can withstand extreme environmental conditions, which may be a usual scenario in law enforcement and military applications. It can not only survive extreme temperature, but also comes with ingress protection against water/dust thanks to its design confirming with IP67 (for desktop model) and IP65 (for OEM model) ingress protection. Lumidigm solutions from HID Global are known industry-wide for their superior performance and are the leading providers of secure, reliable and convenient biometric authentication solutions. Lumidigm fingerprint sensors include multispectral imaging technology that is critical in identity applications where knowing “who” really matters. The sensors from Lumidigm are utilized in various demanding applications industry-wide such as authentication of bank customers at ATMs, prevention of ticket fraud at entertainment venues, securing international borders, ensuring public goods and services reach the intended recipients etc. With Lumidigm solutions, customers are able to know with certainty who is transacting and this assurance is very important and essential to a complete authentication solution. 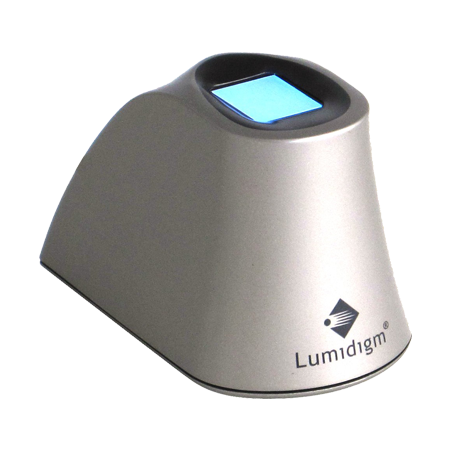 Lumidigm M301 is a stand-alone reader and can be easily connected to a PC or intelligent controller via USB cable. This device utilizes multispectral imaging technology that allows it to capture even the most difficult fingerprints. Since the M301 can look at and beneath the skin surface it is able to perform live finger detection and reject any spoofed or faked ones. The device installation and operation is simple and the M301 reader can be configured to support various modes of operation. Enrollment as well as user authentication can be performed on the same device. Also once the reader is connected, high quality images of 500 dpi can be quickly and consistently delivered to the host PC or controller. The highly integrated and advanced architecture of the M301 make it an incredibly fast and accurate device where a simple tap of the finger is enough to reliably authenticate a user and ensure biometric accuracy. Its various advantages include a lightning fast sensor that produces superb quality images, spoof detection and ease-of-integration. 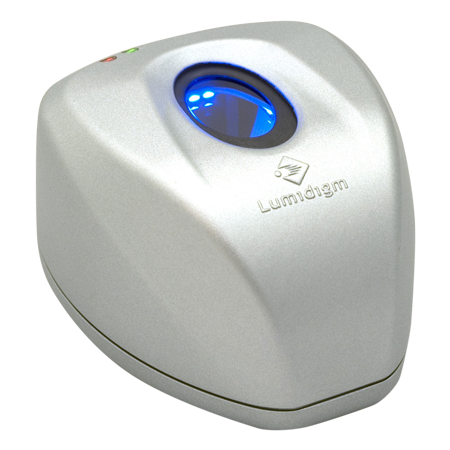 The Lumidigm M311 is a multispectral imaging biometric scanner that produces 20% more reliable images than conventional scanners. It can capture the rich fingerprint data that lies beneath the skin surface to produce superior quality images and works on everyone, everywhere without compromising on the convenience aspect. It is able to close the frustrating performance gap of conventional biometric authentication technology and exceeds customer expectations by providing a convenient, lightning-fast and simple identity management solution. The M311 scanner can authenticate users with a simple finger tap and on the first try. It does not matter who the users are or what the weather is doing. This device is highly durable, requires minimal maintenance and is able to perform in challenging environments such as rain, cold, hot or dry. The V311 belongs to the Lumidigm Venus series sensors. This scanner is capable of reading both the fingerprint surface and the subsurface simultaneously to produce superior quality images of any finger in any environment. It uses multispectral imaging technology that allows it to capture clean and clear images even when the surface features are absent or difficult to distinguish. Various factors such as age, dirt and skin or environmental conditions can affect the finger surface which affects the quality of images produced by conventional scanners. But the Lumidigm V311 is able to enroll and verify even those fingerprints that are an obstacle to conventional scanners. This device is equipped with multiple communication interfaces and the best spoof detection technology available in today’s biometric industry. 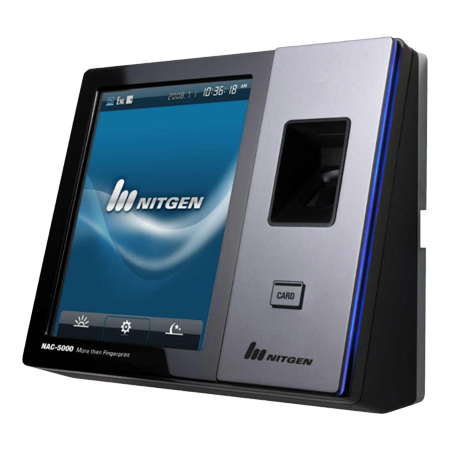 Nitgen has been in the field of fingerprint scanner production since 1999 and is a leading biometrics company today. Nitgen uses a unique optical design technology to produce sensors that have a compact size and almost zero image distortion. Nitgen’s sensors are both ISO9001 and ISO 140001 certified and show the company’s commitment to providing quality products, customer satisfaction and environment management. Nitgen’s original fingerprint recognition technology has received many awards and certifications that prove its quality and they are the certified experts offering advanced biometric solutions for time and attendance, access control as well as PC security. 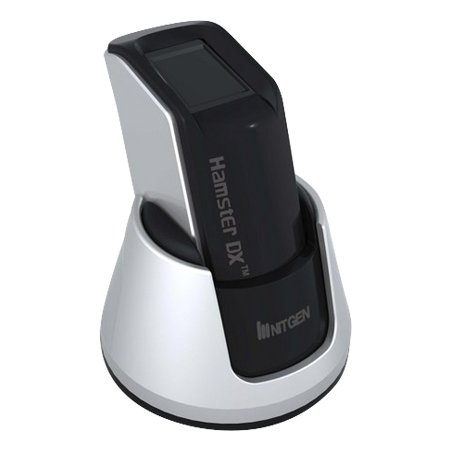 The Nitgen Fingkey Hamster is an optical USB 2.0 scanner that is suitable for desktop usage. Also, the setup process is simple and hassle free enabling easy integration of fingerprint solution into existing systems. One important feature of the Fingkey Hamster is its cutting edge scanner that can detect fake or spoof prints. The device also has a very powerful and reliable matching engine and top-notch built-in identification verification technology. This technology proves helpful in situations where the scanned fingerprint is dirty or does not resemble the print under normal conditions. Conventional scanners might not be able to produce high quality images of such fingerprints and users will have difficulty in accessing their devices. However, wet or dry skin is not much of a problem for the Fingkey Hamster and it is able to produce high quality images. This increases the speed and reliability of accessing locked applications with the Fingkey Hamster. The device is also robust, durable and can fit comfortably into any space. Nitgen Fingkey Access is a rugged and water proof reader that comes with live finger detection (LFD) feature. 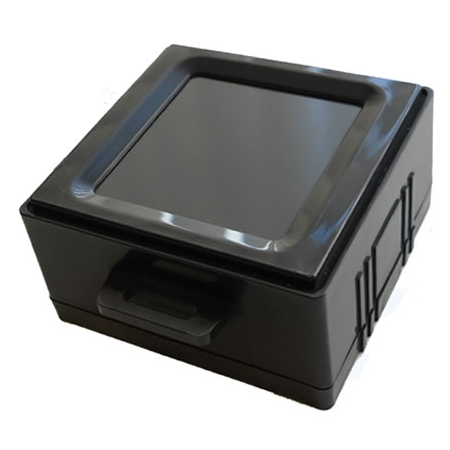 This device is suitable for outdoor use and supports waterproof at the level of IP65. It is a cost-effective and speedy fingerprint access control device that offers enterprise wide Time and Attendance management systems. The Fingkey Access is able to provide these services as it features integrated monitoring and management of multiple terminals operating independently on a remote location using its LAN communication infrastructure. This device works with any combination of fingerprint, RF cards and passwords. Other advantages of this device include compact and modern design with user friendly interface. The NAC 500 is a cutting edge sensor from Nitgen and comes packed with several attractive features such as Nitgen’s superior algorithm as well as large LCD and convenient touch screen. Its innovative design and superior algorithm allow speedy authentication and makes it a world leader in access control solutions. This device is mostly designed for large scale biometric security implementations and uses TCP/IP and wireless LAN. This device also comes with time and attendance software and can be used in conjunction with other readers such as the Fingkey Hamster, Fingkey Hamster II or Fingkey Hamster III. 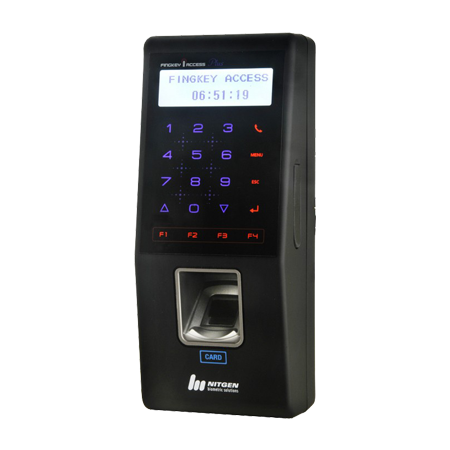 The NAC 5000 works with any combination of fingerprint, password, RF card and face. Suprema is a world-renowned and fastest growing company specializing in biometric solutions. Currently, Suprema has a worldwide sales network spanning across more than 133 countries and is the only biometric specialist company to be listed in the world’s top 50 security companies. It combines top notch engineering with the best proprietary algorithms to manufacture reliable and industry leading products. Suprema is committed to innovation and continuous development of quality biometric products and its extensive portfolio includes access control systems, time and attendance systems, embedded fingerprint modules and live scanners. 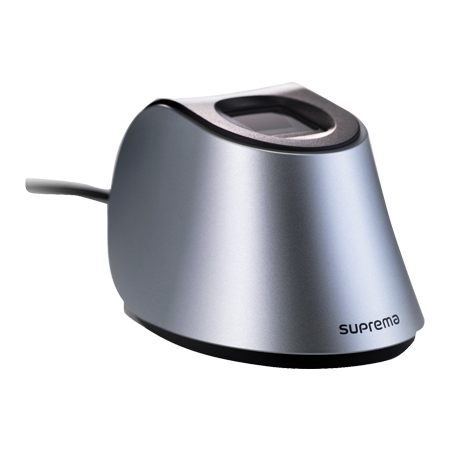 Suprema devices are used in various applications such as electronic passport, criminal identification, immigration inspection etc. The Suprema BioMini Plus 2 is a high performing fingerprint authentication device that has received numerous awards. The BioMini Plus 2’s algorithm is said to be the world’s best that enables the BioMini Plus 2 to have the lowest error rate and the best verification speed in the industry. It has a rugged and high quality optical sensor that captures excellent resolution fingerprints of 500 dpi. The sensor surface is also dust and water resistant that adds to the durability of the device. It also has a simple plug and play USB 2.0 interface that allows hassle-free setup and continued usage. This scanner finds use in several sectors such as PC or Network security, banking and finance, time and attendance systems etc. The Suprema BioMini Plus is a high performing optical scanner that is suitable for both desktops as well as network environments. The BioMini Plus is FIPS 201 certified which ensures that the scanner is compliant with the image quality specifications as described by the FBI’s next generation identification system. It uses the multiple award-winning Suprema algorithms and also features hybrid live finger detection technology. The BioMini Plus has a sleek and ergonomic design along with a rugged optical sensor that can capture high resolution 500 dpi images. The live finger detection and the Suprema algorithm carefully analyses and dynamically changing patterns, unnaturalness or liveness of features. If the analysis reveals any fake fingers, the BioMini Plus will reject such prints and thus is able to provide a very high-level and accurate biometric security solution. The RealScan G10 from Suprema is a compact and portable FBI-certified scanner that is designed for single as well as 10-print capture. The device is housed in a tightly sealed and rugged IP54-rated dust and water resistant structure that enables it to perform faultlessly even under very harsh conditions. Its solid and scratch resistant surface also makes the product very durable and long lasting. The RealScan G10 has an incredible frame rate of over 20fps that attributes to its extra high speed processing and superior quality image delivery. It also comes with FBI IAFIS Appendix F certification that adds to its credibility and makes it a perfect scanner for forensic and civil applications that need ten-print capture. Production of BioMini Plus has been stopped by the manufacturer. Crossmatch offers flexible and field-proven solutions for a wide range of industries – from mission-critical and high-stake sectors of law enforcement and defense to the productivity-driven retail and enterprise environments. Crossmatch offers a broad range of hardware and software solutions for organizations looking to implement biometrics in order to meet their identity management challenges. The company’s continuous commitment to product innovation helps them to meet the evolving security challenges and deliver leading-edge solutions for various sectors. All segments of customers such as system integrators, end-users and value added re-sellers prefer Crossmatch solutions due to its innovative approach and also customers know that their investment will be well-protected. This high performing USB fingerprint reader from Crossmatch has a sleek and elegant design along with a soft blue glow. It is designed for shared environments, power users and seems a natural choice for users looking for a reliable reader. The technology utilized in U.are.U 4500 readers is optical fingerprint scanning and therefore the images captured by this reader is of a very superior quality. The U.are.U 4500 reader is also able to identify even the most difficult fingerprints because of its FingerJet matching engine. Its small form factor and special undercoating make it a sturdy and lightweight reader with high reliability. The verifier 300 is a single fingerprint scanner that is an ideal choice for identification, verification and registration programs. 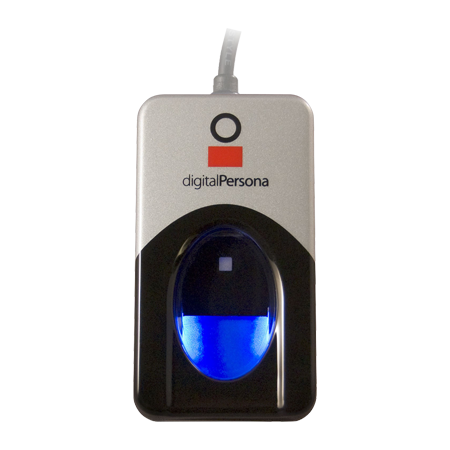 It has a compact size that enables easy integration of biometric technology into existing applications. This scanner uses patented spherical lenses and enhanced illumination techniques to capture superior forensic-quality fingerprints. It has automatic capturing and intuitive design that can be mastered with very little training. 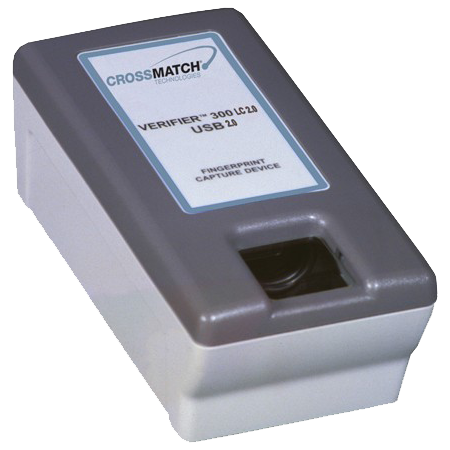 Crossmatch Verifier 300 has been successfully deployed in various projects such as national identification and registration programs, border entry and exit control, physical access control projects etc. Various advantages such as durability, low maintenance requirements and superior image quality make the verifier 300 an ideal reader for demanding applications such as access control in correctional facilities and hospital patient record verification. 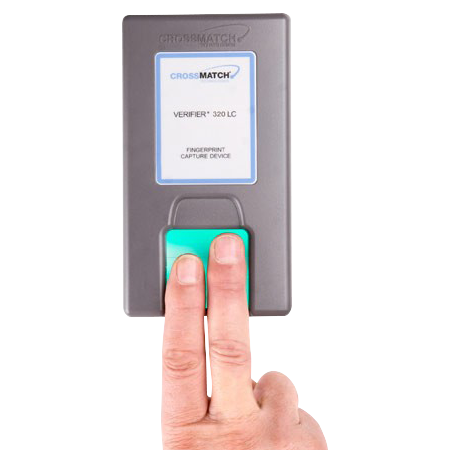 The verifier 320 from Crossmatch manufacturers is a dual fingerprint scanner that is an ideal solution for identification, verification and registration programs. 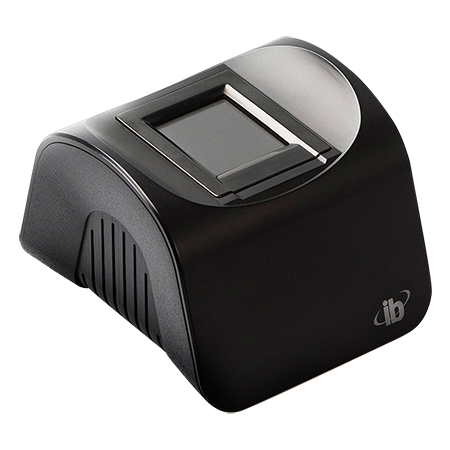 The verifier 320 is a unique forensic quality two-fingerprint capture device that provides enhanced accuracy and reduced enrollment time as compared to single print scanners. This scanner is able to simultaneously auto capture two flat prints as well as automatic capture of 1 rolled print. It is a FBI Appendix F certified scanner and also compliant with FIPS-201 (PIV). Verifier 320 is a scalable system and thus it is a great choice for both low and high volume deployments. It has features such as Rapid Id that allows dual print capture at 15 frames per second and makes the verifier 320 one of the fastest dual-fingerprint scanners on the market. Other advantages include compact size that enables easy integration into existing biometrically enabled security solutions and also durable polycarbonate casing. Production of these products has been stopped by the manufacturer.